EngagingPatients.org It’s Time to Truly Share the Chemo Decision with Cancer Patients - Welcome to EngagingPatients.org! You (or a loved one) has cancer, but the latest round of chemotherapy has unfortunately had only a modest impact. While you’re acutely aware of the “wretchedness of life that becomes worn to the nub by [chemotherapy’s] adverse effects,” you’re also a fighter. How do you decide whether to continue with chemo? The answer to that question is both intimately personal and inextricably tied to health policy. Cancer is the leading cause of death among those aged 60 to 79, and it is the second leading cause of death for all Americans. With expenditures on cancer care expected to top $158 billion (in 2010 dollars) by 2020, the financial and emotional stakes are both high. Medicare’s Oncology Care Model aims to involve patients closely in treatment decisions but falls short of establishing a formal process for shared decision making. Last July, the Centers for Medicare & Medicaid Services (CMS) launched a five-year program meant to change how oncology practices are paid for chemotherapy. Its goals were reducing unnecessary spending, improving care, and involving patients more closely in decisions. In a recent policy report from the Urban Institute, Shared Decisions in Cancer Care: Is Medicare Providing a Model?, Bob Berenson and I focused on that last goal. 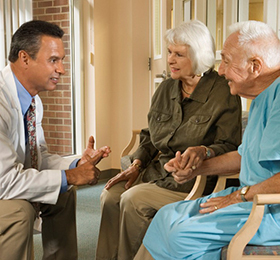 We concluded that Medicare’s Oncology Care Model (OCM) falls short. Yes, it is “patient-centered” in that it includes a 13-point care plan recommended by the Institute of Medicine (IOM); that’s a big step forward. Yes, the OCM tries to reduce overly aggressive use of chemotherapy and underuse of hospice services among patients close to death. Nonetheless, a formal shared decision-making process (SDM) remains vitally important. That’s clear from repeated IOM recommendations since 1999, as well as our review of the literature. What’s also clear, though, is that no powerful groups were lobbying for formal SDM, while, not surprisingly, provider resistance remained. As a result, despite nearly two decades of policy recommendations, the formal SDM required in OCM draft regulations in 2015 disappeared from the final regulations with barely a ripple of protest. The omission is important, because the OCM is influential. It involves more than 195 oncology practices nationwide, affecting an estimated 155,000 Medicare beneficiaries. In addition, 16 private health insurers, including Aetna, Cigna and Highmark, are patterning their own payment models after it. The problem of overuse of chemotherapy in late-stage cancer is well known. In 2012, an American Society of Clinical Oncology expert panel concluded that chemotherapy use among patients for which there was no evidence of clinical value was the most widespread, wasteful and unnecessary practice in oncology. Yet important doctor-patient conversations about prognosis in advanced cancer frequently don’t occur or take place late in the course of illness with someone other than an oncologist. Many patients receiving chemotherapy for end-stage cancers do not understand it is unlikely to be curative. (Or, I suspect, the financial incentives the OCM is intended to address for oncologists to keep on prescribing chemo anyway.) In a 2016 survey of cancer patients, one-third of respondents said they weren’t getting the information about treatment options they needed to make an informed decision. A conversation about continuing chemotherapy is not only difficult emotionally; it also requires doctors to understand how the framing of a decision and the information that underlies it can bias the results. When SDM is done right, however, it can improve care quality, appropriateness, and value without creating anxiety or diminishing hope. It may also address social disparities, since black and Hispanic patients tend to receive less information from their doctors about the reasons for treatment recommendations. From the narrow view of value-based care as obtaining better outcomes at lower cost, there’s inadequate evidence to tout SDM as a cure for overtreatment. However, there’s an important distinction between moral values, such as patient autonomy and peace of mind, and solely economic ones. A large body of research indicates that many of the 1.7 million Americans diagnosed with cancer every year would greatly value more information-rich conversations with their doctors. Whether or not that desire for greater control over life-and-death decisions saves money for third-party payers, the implementation of shared decision-making shouldn’t require a moonshot-level effort.